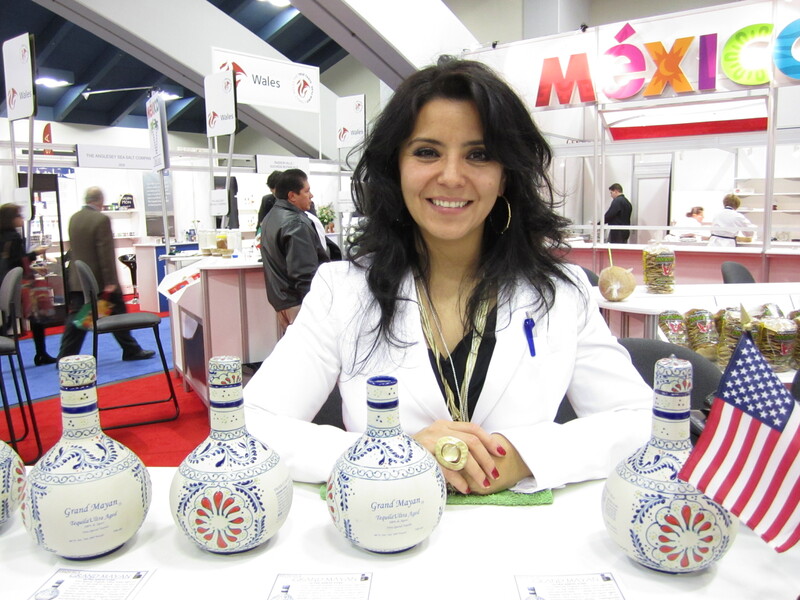 The San Francisco Fancy Food Show is almost done, only a few more hours to go! I spent five hours day one and three today tasting through as much as I could, hard work, really! I think I could not have eaten more cheese than I did yesterday. Overall there were a ton of great new products, but I have gathered some information about some of my favorites, so look for them! I am also mentioning some of my favorite products that even though they are familiar I had to sample again. Exciting trends and popular items I found were the ghost chile, single origin chocolate, tea made from chocolate, salumi, chocolate bars and truffles, and low calorie, dry sodas and beverages. I rarely if ever eat salsa in a jar, but just the other day my favorite Mexican market salsa even disappointed, I mean you just can’t get great tomatoes right now, so maybe this put me in just the right mood to dig the Mrs. Renfro’s Ghost Pepper Salsa! Also the ghost pepper, who knew? 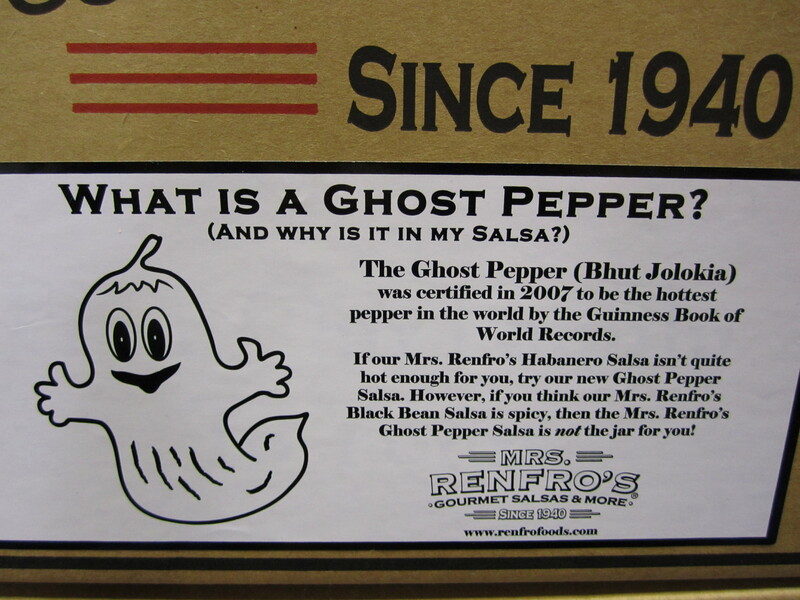 in 2007 the Guinness Book of World Records confirmed that the Bhut Jolokia is the hottest pepper ever, not sure why or how they did this, but… It has a kick very unlike most jarred salsas which I often find so dull and boring… I am sure that their other salsas must be great as well, but I am literally going out to buy this very soon. I think that it would be fantastic on eggs. A Parmesan cheese and olive oil concoction that is ideal for dollops atop a burger or cracker. Truly delicious and they also make some other fun sauces. Numerous beautiful dips and delicious light crackers and the most beautifully decorated stand in the entire show. Definitely search out the American Cheese Society with a big presence from Wisconsin cheeses, my favorite was the Bleu Mont Dairy Co. Reserve, you could really taste the milk and the grass that the cows fed on in this cheese despite the long aging time. I am a huge fan of Redwood Hill Farm’s goat cheeses, especially Camellia and Cameo, although I am usually not so into goats cheeses. These still have the goaty flavor (which I enjoy) but without the dry chalkiness. The Cameo has peppercorns and lemon verbena laid on top of the cheese for added flavor. Although most bee-line for the Humboldt Fog, I am less of a fan of that but a huge fan of the Lamb Chopper, a firmer cheese with a great nutty texture. Just delicious. Some of the best crackers out there, and luckily I had to keep moving because I could eat their cheese coins all day long. This company has a really nice Scamorza and offered a really unique pairing of their blue with a ginger snap, it’s more of a dessert cheese, soft and spreadable rather than crumbly. Very tasty. One of my favorite French cheeses from the Jura, really simple nutty and delicious. I love to chop it into bite sized pieces and take it on trips for snacking. I have always been a fan of Karoun string cheese, especially with caraway seeds, but now they also have Yanni, a grillable that’s less salty than Haloumi. Really tasty and they are a local producer here in Northern California. These amazing caramels and caramel sauces are not to be missed! Try a cone of caramel corn in one of two flavors, Pistachio Caramel and Spiced Almond Caramel or the Bitter Sea Salt caramel. 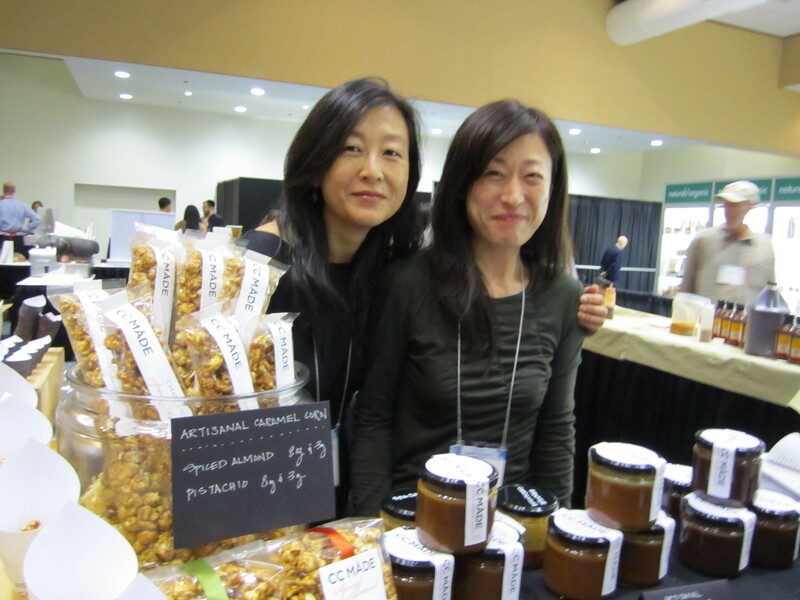 Cassandra Chen and I worked together at Jardiniere and so I am so happy to have a chance to once again taste her creations! She’s a foodie and really knows flavor, so as a fun exercise she has also paired her caramel sauces with unique salts. She was also kind enough to give me tips on her favorite products in the room! CC Made is in the New Product area. Single Origin Chocolate Venezuelan 39% and 74% and Dominican Republic 72% Chef Julian Rose is Master Chocolatier and Director of Research and Development. Their catalogs they have some really fun truffle like critters, a Toffee Pig, and Extra Bittersweet Lamb. Fortunato No. 4 is a bar made from Pure Nacional cacao, thought to be extinct but found in a remote canyon in Peru and Moonstruck is the exclusive retailer in the US. They also have Chocolate Cafes if you find yourself in the Portland area. Caramel Crackle almond and pistachio salty crispy crunchy snack and other crispy bark type chocolate snacks. Very tasty! Made by 4th Generation Italian Salumiere Olli Colmignoli these salames are made with pork from pasture bred pigs on sustainable farms. The Lomo and Coppa were particularly good, my last bite yesterday and I have planned that it will be my first bite today. They are located in the new products room and are well worth a visit! Owned by Herb and Kathy Eckhouse La Quercia specializes in amazing organic charcuterie products hand made using high quality base products. All the meats are great, especially their Berkshire Heirloom Prosciutto (the first and only organic prosciutto currently available in the US) and a great thing is their packaging has biodegradable interleaving. I have always been a fan of Yamamotoyama’s teas, especially their packets of easy to mix iced Japanese green tea (great to drop into any water bottle while you are travelling and don’t have time to make a coffee in your hotel room!) Today I tried an amazing and fun product, SushiParty, a soy wrapper in multi color (Sesame, Pink, Spinach Green, Paprika Orange, Original and Turmeric Yellow) that is ideal for wrapping just about anything. Today I had it with a much welcomed salad, but it could be a godsend when I find myself trying to deal with a Thai style shrimp wrap or some such thing. All are non GMO and naturally colored. I love miso soup but I get really irritated at those plastic bags that you end up disposing of after 1-2 servings, and they squirm around my cabinets and fall out every time I go in there, so I was excited to see these fun soups in a nice recyclable plastic jar, add as much or as little mix as you want to balance the flavor to your liking. The traditional was the best and they do a Vegan Sesame that is made without the bonito flakes subbing mushrooms. There wasn’t quite the same crowd surrounding Preeti Mistry as there was around Guy Fieri and the Ace of Cakes dude, but her Thai Carrot Ginger Soup was delicious, and vegan. 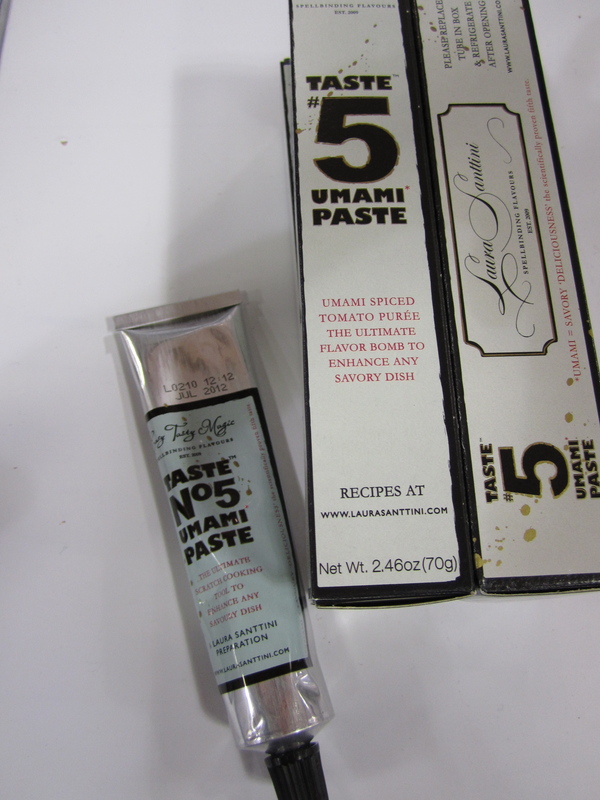 Preeti was a contestant on Top Chef Season 6 and used the La Tourangelle Thai Wok Oil in the soup. Their avocado oil was delicious as was the pumpkinseed. Their nut oils are all made using local Northern California nuts and of course they have a delicious white truffle which I like to use on popcorn. These gorgeous packages are a standard on the shelf, but I had never tasted their Rich Santa Fe Blend, a subtle blend of peppers, but not spicy it would make a delicious dressing or marinade and it contains not fat at all! Their new Classic Buttermilk Ranch is tangy and tasty and the Dijon Honey Mustard more at home as a dip than a dressing, sweet and rich. I am a big fan of flavored waters without any added sugar, and Hint has absolutely no sugar at all, it’s one of my favorite beverages because it has zero calories. Their flavors tend towards fruit based items, it reminds me of Smart Water before they started in a different direction. Very similar to Hint Water in that these have no sweetener or colorings, but they are as the title suggests based on herbal flavorings, there’s a really exciting range of flavors, and two are actually sparkling, but my favorites are Lemongrass Mint Vanilla, Lavender Mint, Cloves Cardamom Cinnamon (very fall like!) and Lemon Verbena Geranium. I appreciated that the vendor took me through a “flight” of the waters from lightest in intensity to fullest, just like wine, and some of the flavors are reminiscent of wines, the Lemon Verbena Geranium reminding me of Gewurztraminer. These could be really interesting in a cocktail. They are USDA Organic certified and the water comes from a spring in the Blue Ridge Mountains of Virginia. Also has zero sugar, zero calories, zero preservatives and zero artificial ingredients. 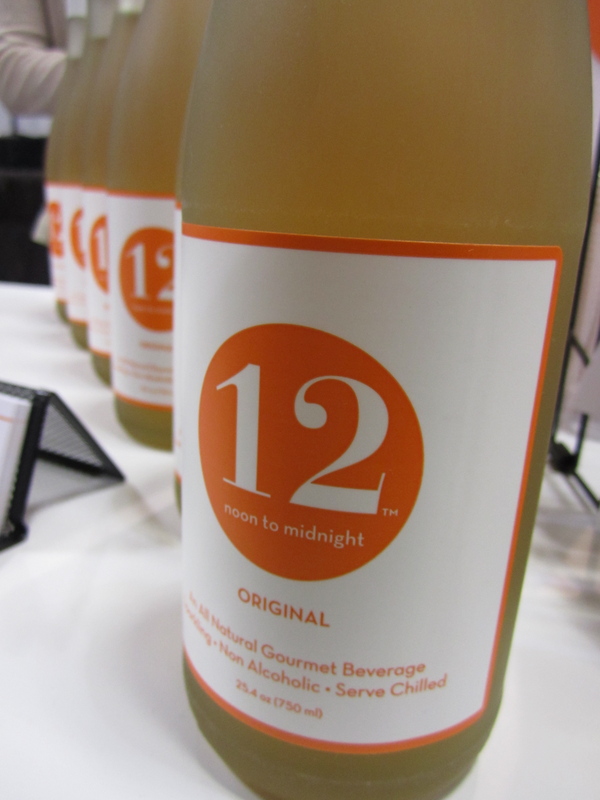 I was inundated with “low calorie”, no added sugar soda type beverages, but one that really stood out was 12 Beverage. They make an absolutely delicious “white” beverage with notes of fennel and ginger. No wonder it actually tastes good it was designed by Alfred Portale and David Burke, two New York chefs. The flavor is very adult and reminiscent of wine but a great non-alcoholic alternative. Not overly sweet either. I don’t want to get you too excited because these are not yet imported, but they are delicious sodas lightly flavored and not too sweet! Elderflower & Rose and Raspberry & Lavender. It’s amazing how many of the best products I tried came from Portland. This tea was really amazing and if you ask nicely they may let you try some of their cool tea infusions. First they take local fruits, such as marion berries, and infuse them in water, then they make tea with that water, so it gives a very subtle fruitiness to the beverage. They were really delicious. Tea made from chocolate, it had a really interesting slightly earthy flavor. They served it unsweetened and it reminded me of buckwheat tea, it’s made from the husks of the chocolate and is supposed to be very healthy. They also make fantastic chocolate coated nibs, Kakosi nibbles. 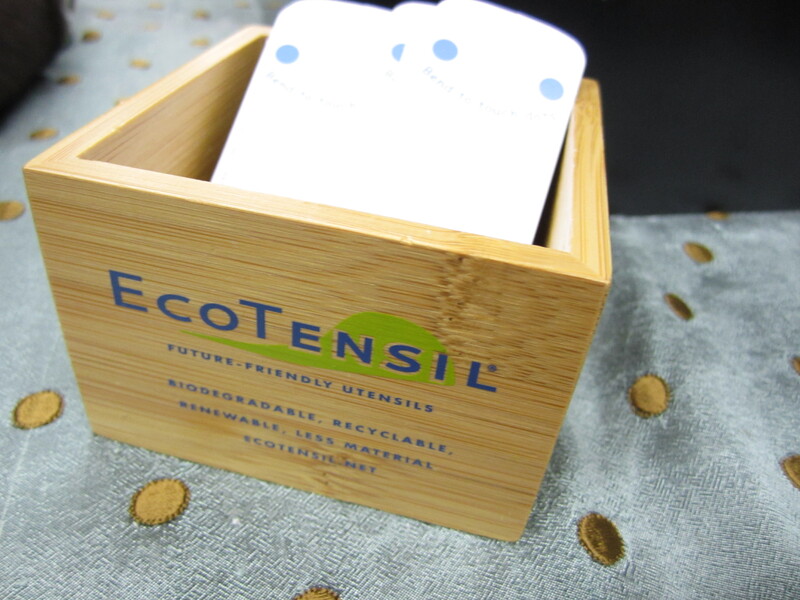 A few purveyors were decidedly annoyed when rather than asking them about their product I asked them about the cool Ecotensil, a tiny strip of heavy coated paper that you bend into a spoon shape, brilliant idea and 100% biodegradable and/or recyclable! They break down faster than corn based spoons and take up less room when shipped! WHERE TO GET A DRINK! Other ways to get your drink on, Tortuga Rum Cakes is now making a rum flavored turtle chocolate, in keeping with the name (tortuga of course means turtle in Spanish the name Columbus gave to the Cayman Islands, like the little turtle shells sunning on the shore) and they have a delicious rum soaked cake in multiple flavors. www.tortugarumcakes.com The Perfect Puree of Napa Valley www.perfectpuree.com was making cocktails with Jenni and Marko Karakasevic of Charbay yesterday and today with H Ehrmann from Elixir and Square One. 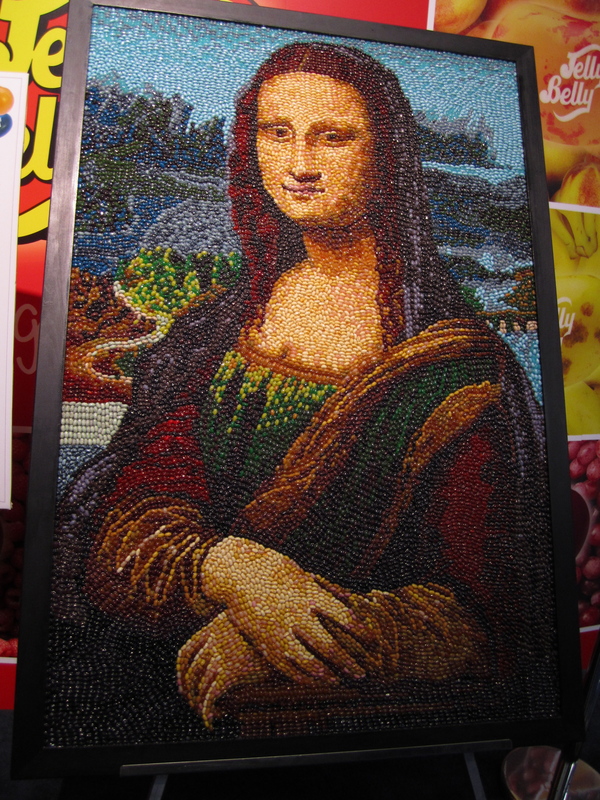 If you are at the show don’t forget to stop by Jelly Belly for some dog food flavored jelly beans (kidding, but I did taste them) and to check out their cool jelly bean artwork!